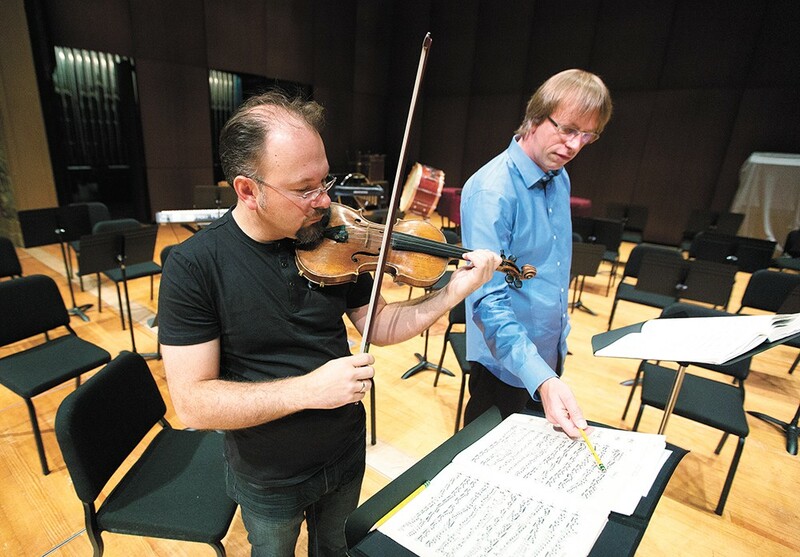 Mateusz Wolski, left, solos this weekend for conductor Eckart Preu. Classical music owes a lot to Clara Schumann. It was Clara who made it de rigueur for concert musicians to perform pieces from memory. It was Clara who championed works by Johannes Brahms when the composer was still unknown. And it was Clara who used her own considerable musical talents in the service of her husband Robert's genius while also providing for their large family before and after his death. It was Clara, too, who inspired much of Robert's music, including his Symphony No. 4, first completed the year after their hard-won marriage. That orchestral work is the centerpiece of this weekend's Spokane Symphony Classics Series concert, fittingly titled "Love's Inspiration." "It is really important for me that every concert has a very different feel to it," says Director Eckart Preu. He points to the "light, virtuoso, rhythmic" qualities of the symphony's recent "Spanish Nights" concert by way of comparison. "When you come to 'Love's Inspiration' and a more German repertoire, you're in a much more romantic, lush, melodious world [that is] also darker in many ways but also beautiful. This music will go to the soul." Whence it came, you might say. Robert Schumann is the quintessential Romantic — unabashedly passionate in his likes (Mendelssohn, Chopin) and dislikes (Liszt, Wagner), subject to extreme swings between melancholy and mania, plagued by hallucinations of angels and hyenas and a sustained "A" note ringing in his ears. He ultimately descended into suicidal madness and suffered an early death in a sanatorium. "He represents in many ways the typical ideal Romantic artist that we imagine, the borderline between genius and madness," says Preu, noting that, in true Romantic style, extra-musical narratives from life and literature often informed his compositions. "Music having a story to it was new at the time, or was at least revived from the Baroque. Schumann even sometimes put names and titles [to his work] but then took them out because he knew it would take away from the music if he was too specific. Brahms was very different from Schumann. He was always insisting that his music did not have any story to it." As no Romantic would be complete without a muse, Robert found his own in Clara. Yet, intriguingly, so did Brahms. Brahms is partly reunited with the Schumanns in "Love's Inspiration" through his Violin Concerto in D Major, with Concertmaster Mateusz Wolski soloing. After the concerto premiered in 1879, it became somewhat infamous for conductor Hans von Bülow's description of it as a concerto not for the violin but against the violin. "Times have changed," Preu laughs. "That quote was an early quote. Brahms is not a fiddle player, he's a pianist. And when you play the piano, you have five fingers on each hand. When you play the violin, however, you have only four because your thumb serves as support." That pianist-inflected composition makes the concerto extraordinarily technically demanding, but its pyrotechnics are subordinate to substance. "Sometimes, for certain concertos, the purpose is to show off, and sometimes it's part of something bigger," says Preu. "Here it's a very different kind of virtuosity. The purpose is to touch people's soul." Although Clara's influence will be palpable in each composer's work, her own pieces are conspicuously absent from the program. Instead, it completes its trifecta with Bach's Overture from Orchestral Suite No. 1. "She was a phenomenal woman — a super smart, virtuoso pianist. But if you perform Clara, you go to one of her piano concertos, and you need a pianist who has it in their repertoire," says Preu. The original print version of this article was headlined "Love Triangle"